In a world where the nexus of government and business is constantly evolving, an integrated, tailored government affairs plan is a critical element of a successful business strategy. This may mean having a trusted partner to put out the occasional fire, or it may mean having regular access to an expert who can help you forecast how a piece of legislation will affect your bottom line. Either way, the right people can put an underutilized tool into your hands to help you enhance positive business outcomes. Relationships mean something in the world of politics and policy. Decision-makers act quicker and more decisively when they hear from people who have been in the trenches with them. The professionals at Taylor English Decisions have a broad array of relationships across party lines and at the local, state, and federal levels—as well as internationally. We don’t hesitate to tap into our network to get results for our clients. Additionally, an on-going analysis of legislative and regulatory issues is crucial to comprehensive growth. Every day, there are developments in governmental centers of power that directly affect every industry. The first steps begin with a thorough exploration of how the issue is being handled within the government, the environment in which the issue was cultivated, an understanding of the motivation of the issue’s sponsors, the issue’s potential effects on business, and an expert opinion on the course the issue will take. Our approach is objective and purely non-partisan—we go where necessary to get results. The ultimate aim is to equip clients with access and information others do not have. From this foundation, comes effective strategies to achieve success. 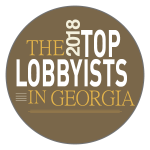 In our first year of business, we were ranked #7 in James Magazine’s Top 10 Governmental Affairs firms associated with a law firm.